Do you comply with California Cannabis Laws, how about Colorado’s, or the numerous other states and provinces that have legalized medical marijuana or recreational marijuana? JWC Environmental is an integral part in making sure you comply with marijuana plant waste disposal regulations in any state! 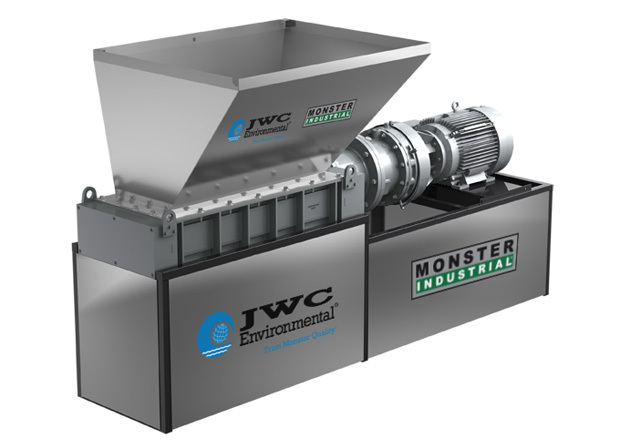 JWC’s Monster Industrial Marijuana Shredders are driven by electric motors meaning they are quiet, can be used indoors or out, and transmit zero gas and exhaust fumes. These marijuana shredders are powerful low speed, high torque, dual shafted grinders. They easily grind wet or dry material including entire plants, large root balls, soil, plastic pots or other waste! These shredders are a great alternative to wood chippers that are loud, can only be used outside, may get damaged or clogged by rocks and other debris and can’t handle wet waste! Marijuana waste disposal laws usually require that Marijuana plant waste must be rendered unusable and unrecognizable by grinding and incorporating it with other ground materials. The resulting mixture must be at least 51% non-marijuana waste by volume. No matter what you mix the marijuana plant with, to make it unusable and unrecognizable (soil, plastic pots, netting, food waste, cardboard, etc. ), our shredder can handle it! Monster Industrial marijuana, cannabis and hemp plant waste shredders have two rows of sharp, steel cutters that rotate slowly and with incredibly high torque to turn large troublesome solids into small pieces. They are powered by quiet, electric motors, transmitting zero gas and exhaust fumes. The SHRED series are available with hoppers and stands configured to your specific needs. They can handle wet or dry material shredding it down to meet regulatory requirements.